elderly day center. I'm going to teach them how to decorate larger size wooden boxes, same as my mini ones. Once in a while a real treasure is found like this "dinosaur". I am sure Baalatova will be delighted to have it. 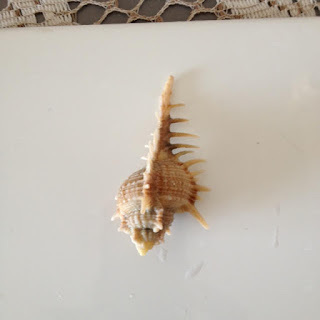 a shell like this. I'll have to ask what to do about the bad smell. the indoor decoration is self crafted with photos to show how it's done. Thank you Katajamaki for following. Я надеюсь, что ваши пальцы чувствуют себя лучше! Вы нашли прекрасные дары природы! Это всегда удивительно! Я думаю, что достаточно прокипятить ракушки. Запах должен уйти. I hope your fingers/hands will get better soon. Si, solo tienes que hervirlas y quitarles el bicho. El muy divertido eso de buscar conchas en la playa. Las que has encontrado son perfectas. Nice shells! I have a few small ones that I .
will use in a bathroom scene. What about soaking the shell in diuted bleach water to remove the smell? Que preciosidad de conchas,son maravillosas y parece mágico poder encontrarlas en tamaño tan pequeño!!! Drora,para quitar el mal olor,debes hervirlas con cuidado en agua con un poco de jabón ,después de quitar el bicho,de ésta manera dejará de oler! Bellissime le conchiglie buon weekend Drora! I love that you harvest the shells in your miniatures by hand, it make the pieces even that much more special! I hope your amazing hand tools and fingers feel better so that they can create more magic! The shells are amazing. Baalatova will be very happy with this dinosaur. Que conchas tan bonitas, deseando ver para que las usas :D, lo del olor se pueden hervir para sacar cualquier resto, pero en algunos caso al hervirlas cambian algo su color. Si las pones con agua y unas gotitas de lejia y las las dejas moviendolas con fuerza de vez en cuando tambien se limpian o dejandolas secar enterradas en arena para que no se sienta el olor cuando todos los restos esten secos saldran rapido con solo lavar con fuerza bajo el grifo. Mother nature gave evidence once more that she's the biggest sorceress of all - what an extraordinarily beautiful shell. Lucky Baalatova to own such a mysterious piece. But the other shells are beautiful too and I like the idea that you're using the bigger ones for boxes being creative with your ladies from the center. Sorry to hear your fingers are causing you trouble still - and about the smell of the shell (sounds great btw *grin*) - maybe you can aks a fish grocer if he has some advice? That seashell is just gorgeous and very interesting. I'm glad you found it. I hope your hands get better. I just leave the seashells for 24 hrs in a bleach bath. I'm glad your fingers are better. And I saw your sweet trailer! It looks so beautiful!! You have such adorable accessories in there. Wow what a wonderful find that shell is beautiful. 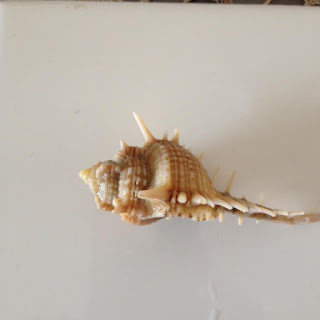 I am sure your ladies will have a great time decorating their boxes with lovely shells. I hope your hands are all better. Que bonitas conchas, el dinosaurio es fascinante! Nunca había visto un ejemplar asi. Me alegro leer que sus manos están mejor. Cuidese mucho. I hope it goes well with your husband and your too. A mi me encanta el mar y por lo tanto todo aquello que tiene. 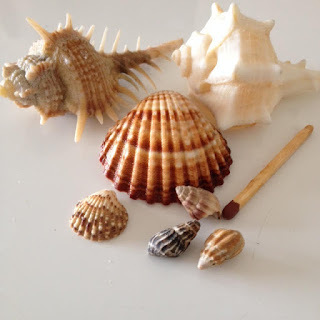 Aunque vivo lejos de él, siempre que puedo me escapo y cuando paseo por la orilla de la playa me gusta recoger las conchas que arrastra hasta la orilla. 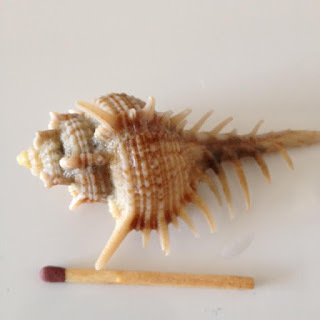 here we have hard to find shells so small, they are superb!